1. Allah Achha karega (God will do good). 2. Allah (God) Malik is the sole Proprietor, nobody else is our Protector. mind, wealth and speech (i. e.) completely and then see what He does. 4 Allah (God) will give you plenty and He will do you all good. 5. Allah (God) is My Doctor. 7. All persons do not see or realize Brahma in their life time. tell Me all that you talked about. the meditator will be one with the Brahma. destined to happen, will happen. 11. Am I not always with you ? Then do you offer Me anything before you eat ? 12. Are not your thoughts, doubts and apprehensions calmed down now ? (Hari) Lord will protect him who has got faith and patience. with you for safe custody; it will be of use to you. 15. As a Fakir, I had nothing to do (or gain) with the Ganges Water. object of My meditation and I was conscious of none else. his first month's salary if he got an appointment. He got one on Rs. 15/- P. M. Then he steadily got promotions from Rs. 15/- he got Rs. and I asked that amount (Rs. 15/-) from him as dakshina. Arjuna to them so that their greatness May increase and be known. 19. After the temple is complete, I will come there to stay. live, move and play there, embrace each other and be very happy. 22. As he committed the theft, he could not but speak out. 23. After doing Benaras and Prayag we would be ahead of Shama. 24. As a result, of their past actions, they were both born as goats. 26. As you did not like my bargain, I sent them back to their owner (Shepherd). 28. As I was preparing to smoke chillim pipe, I heard the croaking of a frog. made and plans with estimates for repairs were prepared. you a hundredfold of what you spend". 32. All were agreed to this transaction, but began to quarrel over the money. cross seven seas to help her. 34. All this is God's Leela or sport. the seven oceans; high mansion is erected for you. 36. Avoid needless disputations and avoid falsehood. 38. Apply heated aloe over the affected part and the pain will be subsided. 39. After he gets well, bring him to Me. 40. Am I not in the place where you go to ease yourself ? Why do you fear ? result of eating any of these is merely the satisfaction of hunger. 44-. As long as the body remains. Samsara remains. 45. All mental and bodily process are Samsara. Lendi garden and see that the lamp (Akhandam) is perpetually burning. Feed it always with oil. 48. Always take your meals before you start for a journey. infinite joy and ever-lasting Contentment. all what you do is known to Me. 52. Blessed and fortunate indeed is he who knows Me. to be Hari, Kara and Brahma (Trimurti) incarnate. 56. 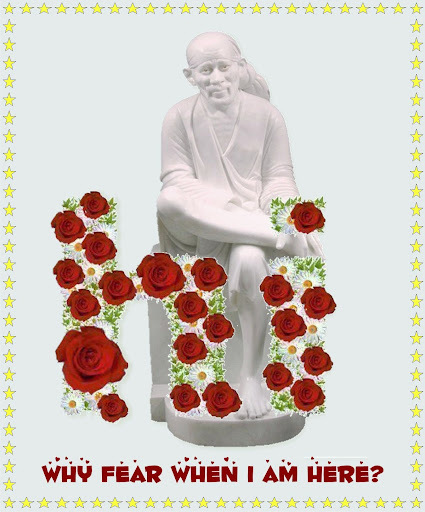 Bapu, I do not want to be entangled in any such wordly things. 57. But what My Sircar (God) gives lasts to the end of time. 62. Build the wada with the temple, I shall fulfill the desires of all. fruit of their action in these bodies. spiritual progress will be rapid. 67. Be contented and cheerful!. not warn you again but leave you to your fate. every one is hitting it. palki. At that time, I had come there. meet thieves at the village gate. 72. Bhimabai, take this leper woman home and attend to her. 73. Bala, do not go home; stay and attend on this Dagdu Bhav (a moslera leper). mango fruit. A daughter is a tamarind fruit. 75. Be my me and keep quiet. I will do the rest, (to Upasani Maharaj). 76. Be not obsessed by the importance of wealth. 77. Be liberal and munificent but not lavish or extravagant. 78. By the action of Karma, I got embroiled and came to a body. 79. Brahman is My father and Maya My mother. 80. By their interlocking, I got this body. 81. By going away to a forest, you cannot escape Samsara. 82. Be quiet. Do not fear. you vexed with or weary of Me ? stability and peace of mind. 92. Do not be deluded with worldy honour. 94. Devotees could never approach Me unless I meant to receive them. attain Paramartha (the spiritual goal of life). 96. id the story strike you ? and did you catch its significance ? meeting will tie clear and open.